In a hurry? Need to feed the family? 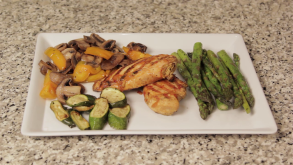 Jules Lieff of Fit Organix has a quick and easy 20 minute recipe full of protein and nutrients. It’s easy, quick and delicious, what more could you ask for? Jules Lieff has been a successful fitness trainer in Toronto for many years. Always wanting to go that extra mile for her clients, she soon noticed that despite their efforts in the gym, their eating habits were the greatest challenge they faced. Jules Lieff created the Fit Organix daily meal delivery system and started a line of Fit Organix products that are gluten, dairy, soy, corn and peanut free, unprocessed and without additives or preservatives. When your body does not have to process allergenic ingredients, your levels of inflammation are greatly reduced. With less inflammation, nutrients are absorbed better and your body is able to function optimally. The most challenging part of a healthy lifestyle is made easier with Fit Organix. The Fit Organix system is breakfast, lunch, dinner and a snack, delivered fresh, daily. You can take your Fit Organix delivery bag with you all day to have fresh and ready meals at all times, refrigerate it promptly, to ensure food safety. At the end of the day, leave your empty bag at your front door, and we will collect it the next morning and replace it with another day’s worth of delicious, unprocessed, freshly made meals.